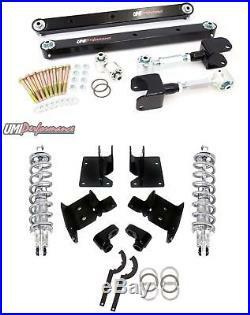 1978 - 1987 GM G-Body UMI Performance Pro-Touring Rear Suspension Kit Black Powdercoat Vi-King Double Adjustable Rear Coil Overs. 1978 - 1987 Chevrolet Monte Carlo, Malibu, El Camino. 1978 - 1987 Buick Regal, Grand National. 1978 - 1987 Pontiac Grand Prix, LeMans. 1978 - 1987 Oldsmobile Cutlass. UMI's new pro-touring kit features all of their top of the line Pro-Tour style components in one convenient package. The lower arms are loaded with Roto-Joints on each end and feature TIG welded sway bar. Sleeves along with the awesome articulation of the double Roto-Joints. The upper arms have Roto-Joints on one end and are fully adjustable to set pinion angle and lateral location. The new Roto-Joint axle housing bushing completes the package and ensures bind-free articulation. This 8 Roto-Joint package is the ultimate combination of street comfort and race winning capability. 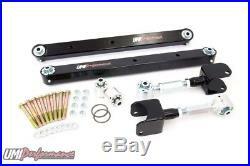 For Pro-Tour cars that see highway use, this kit is like having rod end suspension that just happens to be comfortable. Kit includes boxed lower control arms with Roto-Joints, adjustable upper control arms with Roto-Joints, Roto-Joint rear end housing bushings and grade 8 bolts with nylock nuts. 100% manufactured with pride in Philipsburg, PA - USA. Spanner Wrench- The Spanner wrench is used for adjusting and disassembling UMI Roto-Joints. Over time the Delrin race inside the Roto-Joint may wear, the spanner wrench is used to tighten the adjusting ring applying more pressure to the delrin inside. The spanner wrench is also used to disassemble the Roto-Joint for cleaning, inspection and rebuilding. UMI Performance proudly designs and manufactures its entire line of products within its facility located in the small town of Philipsburg, Pennsylvania. The facility features CNC machining, both milling and turning CNC's, band sawing, press brake operation, MIG and TIG welding, sand blasting, plasma cutting and powder coating. They offer many different levels of their product. To see our other items from UMI Performance We recommend narrowing the results by entering YOUR Vehicle's Year, Make, and Model in the "Store Search" area on the left. 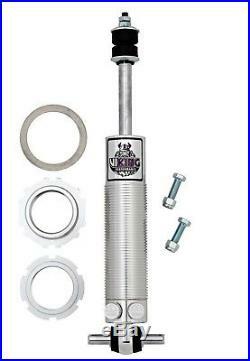 Vi-King Performance Rear Coil Over Package. 2 Coil-Over Double Adjustable Shocks. 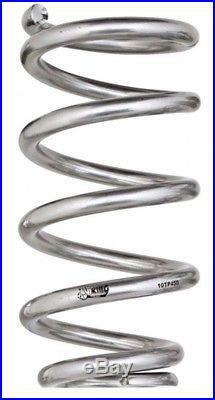 2 Light-Weight, High Travel Coil Over Springs. 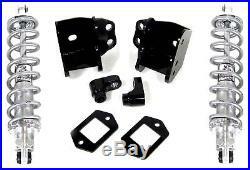 Rear High Quality Coil-Over Conversion Mounting Brackets. 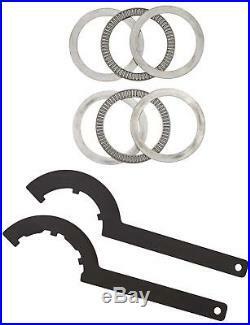 Panner Wrenches & Thrust Bearings. Increased range of ride height adjustment over most other brands. Tight tolerances on threads provides for easier ride height adjustments. Lifetime guaranteed to remain within 2% of the original free height and rate. Vi-King's ultra-lightweight, high travel springs are designed with an expanded body diameter for unsurpassed performance. Over a 25% weight savings over some other brands in the market! Manufactured from high tensile spring steel with a sleek silver powder coat finish as standard! Lengths and rates are clearly marked on springs Lifetime guaranteed to remain within 2% of the original free height and rate under normal operating conditions. With Vi-King you will not get overlapping spring rates, like you may with manufacturers that only hold a 5% tolerance a 2 1/2 times larger tolerance window than Vi-King! Thank you for shopping at Matts Classic Bowties. 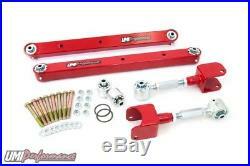 The item "UMI Performance 78-87 Regal G-Body Rear Suspension Kit Control Arms Coilover" is in sale since Monday, October 31, 2016. This item is in the category "eBay Motors\Parts & Accessories\Vintage Car & Truck Parts\Suspension & Steering". The seller is "mattsclassicbowties" and is located in Philipsburg, Pennsylvania. This item can be shipped to United States.